HUNDREDS OF Britain’s railway stations are setting the standard in reducing crime, safeguarding vulnerable people and ensuring safer journeys for passengers, rail minister Andrew Jones has announced. On a visit to East Croydon Station, recently accredited as a secure station by the British Transport Police (BTP), the Rail Minister met with Southern station staff who are helping to make every passenger’s journey safer. The minister also met with BTP officers and charities including Samaritans and the Railway Children, who all engage with passengers to ensure they feel supported and safe on Britain’s railways. 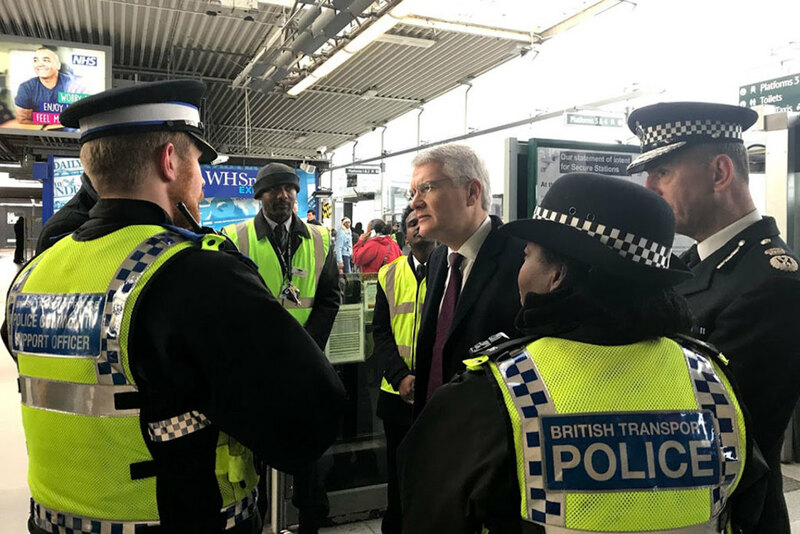 Rail Minister, Andrew Jones said, "The Secure Stations Scheme forms part of the exceptional work British Transport Police, station staff and charities do every single day to give passengers the safe journeys they deserve. "More than 170 stations are now newly or re-accredited under the refreshed scheme, demonstrating an outstanding commitment to tackling crime and safeguarding passengers. "It is particularly poignant and important today to commend the incredible work being done on suicide prevention, ensuring we protect vulnerable people on our railways." British Transport Police chief constable, Paul Crowther said, "Tackling crime and safeguarding the most vulnerable on the railway is one of our key priorities and we’re pleased to see that more than 170 stations have now been accredited under the refreshed Secure Stations Scheme – helping passengers and staff feel safer across the rail the rail network. "The chance of becoming a victim of crime whilst travelling or working on the network remains comparatively low – on average there are only 19 recorded crimes for every million passenger journeys. Secure stations is an important initiative, acting as a national benchmark that police, rail industry and government can work towards making stations an even safer and low crime environment."